Comcast now sells TV, Internet and phone service on Amazon.com in a new retail partnership that has been a year in the making. 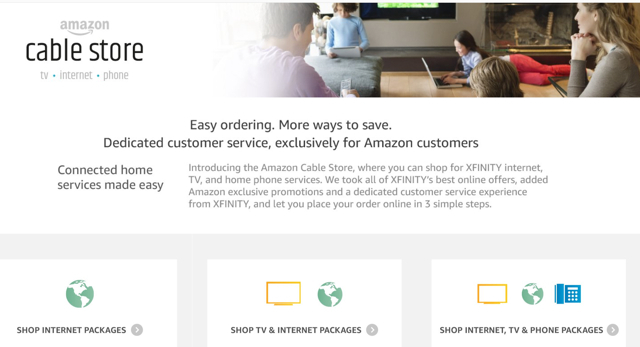 A new Amazon landing page — the Amazon Cable Store — sells Comcast’s Xfinity-branded bundles, with dedicated customer service for Amazon customers. Comcast, which hopes the relationship will improve its customer service image, also opened two customer call centers to focus entirely on Amazon-generated inquiries about Comcast sales, part of $300 million earmarked to improve customer service. The Wall Street Journal says the deal got its start when Comcast chief executive Brian Roberts and cable division president Neil Smit met with Amazon chief executive Jeff Bezos to talk about ways of working together. Selling Comcast products on Amazon was one idea that rose to the surface and the two companies figured out the simplest way to do that over the months that followed. According to Smit, Comcast could sell other products on Amazon in the future, such as its home security service. Comcast, which plans to remodel its brick-and-mortar stores to encourage customers to play with the products to “give them an Apple-feel,” says the new call centers have the goal of answering calls in 60 seconds or less, with no waiting.